Things have been slow on this site this summer. I spent July finishing up my commitments in California and then returned to Seattle a month ago. My Seattle room is still under construction, which is making it hard to settle in. As a result my main computer is unplugged. I’m hoping to have electrical outlets for it this week. Until then I will keep using my Chromebook. Since back in Seattle I’ve been catching up on new content for my coffee site INeedCoffee. There are also a lot more articles coming this fall. I’ve been advised that I should post more frequently to build a larger audience. But I prefer to post quality over quantity. There are too many sites creating disposable content. They tend to be hot for a while and then burnout. INeedCoffee has been online since April 1999. I’m playing the long game. 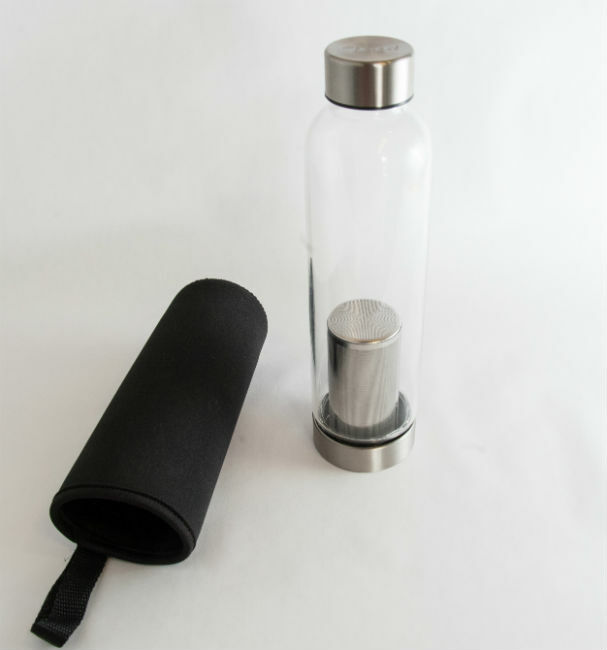 The Perfect Solution For Cold Brew Coffee on the Go was one of the two cold brew tutorials I wrote this month for INeedCoffee. My Duolingo streak is now at 107 days. I slowed down my Spanish learning a lot during and just after the move. Now that I’m caught up on coffee content, I plan to increase my language study time. I have no specific goal other than to keep improving. If one day I am fluent, great. If I can only read a newspaper, that is fine as well. And an update on Waze, which is the app I discussed in the post Learning to Hate Driving Less. I ended up passing all my friends that connected to the Scoreboard via Facebook, except Nikki. There is no way I’ll catch her, especially now that I’m away from the SF Bay Area and back in Seattle where I drive far less. Now my only motivation has been moving up the ranks. Several months ago I achieved level of Knight, which for the top 4% of users. I was two days away from becoming Royalty, which is the highest rank given to the top 1% when I got denied. The rankings are based upon state. 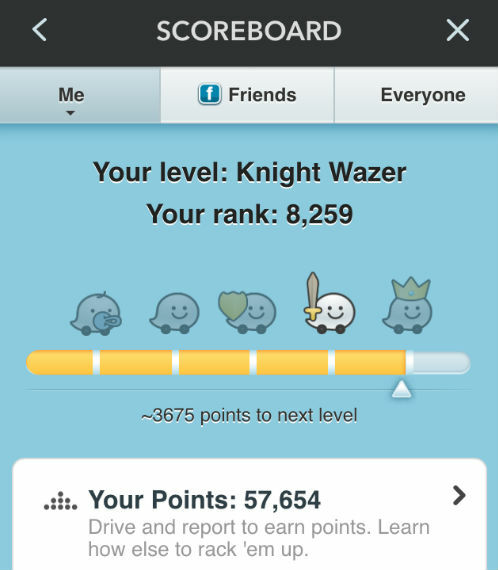 When I informed Waze I was in Washington and no longer in California, the number of points needed to achieve Royalty was 7,000 points higher. So now I am looking at another month or two before I become Royalty. In California this would be enough points to be Waze Royalty. I renewed my web hosting with SiteGround. After firing three hosts last year, I may have finally found a place that can keep the servers running, keep them running fast and respond quickly to support tickets. If you need web hosting that isn’t ghetto, use my referral link. I have several ideas for health and fitness blog posts, but I have more questions than answers. I was going to shelf all those posts, but I realized that many of the commenters on this blog are more knowledgeable than me and that other readers might have the same questions. So look for some discussion posts soon. Nice update. Just go at your own pace. Even once a month would be fine. RE: coldbrew–I’ve never tried it. Can I pour the brewed coffee into a mug and heat briefly in a microwave? (Note, I’m not a purest!). Or is it just for iced coffee? For context, I’ve never cold brewed, and typically use an AeroPress. @Jim – That would be iced coffee. I prefer iced coffee to cold brew, but I use an Aeropress to brew directly onto the ice. I remember reading your comment that the housing crisis would resolve itself. Have you noticed any of that since being back? It seems to have gotten worse to me. @thomas – If by crisis you mean high prices for homes and rents, I revised my outlook last August. I want to be healthy, and I want to get pregnant, but this article talks as though coffee will screw up both endeavors. And I LOVE coffee. Thoughts? @Rita – My coffee site published an article on pregnancy and coffee. 1- There have been billions of successful healthy pregnancies where the mom has consumed coffee before and during her pregnancy. 2- Less is probably the safest approach. What “less” is will be open for interpretation. I’d probably seek out the lowest level that didn’t send me into a depressive funk. Perfect – thank you! You are always a voice of reason, which is why I checked with you before buying into a fear-mongering article!